Remember when Halloween was a big deal? I mean, a BIG deal? What was the most legendary costume you ever wore? What would you dress up as this year? 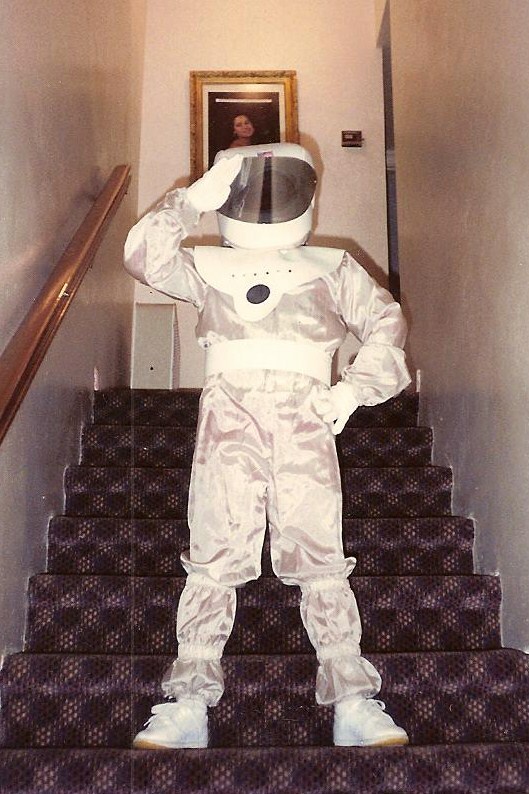 My favorite costume was an astronaut outfit my mother bought for me when I was in third grade. I didn't follow any specific franchise, but I was very excited nontheless. 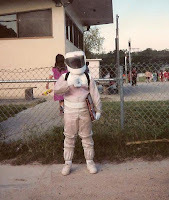 I was fascinated by space and space travel when I was a kid and thought being an astronaut was the coolest thing ever. I was also happy to find a costume that would actually fit. I've always been heavyset and as a kid I usually have to go a couple of sizes bigger when it came time to pick out a costume. It really sucked when I wanted to dress up as Batman or another superhero because I could never find outfits in my size. Not so with this spaceman costume! It was just the right size and only needed a couple of accessories to complete it. A pair of white sneakers and gloves. I don't remember if the gloves were included, but they were a bit large for my hands, making me think they were separate accessories. The helmet was made of soft foam with a tinted visor that could be slid up to reveal my face. Although I didn't take it to school, I carried around an old Lazer Tag blaster as part of the costume when I went trick-or-treating that night. Here's another fun costume I wore about five or six years ago. My brother, cousin and I decided to dress up as an '80s hair metal band, hence the horrible wigs. I'm in the center. I wish I had a video recording of that night because I insisted in speaking with a thick British accent. We didn't play "heavy metal", we played "Ehvy Met-uhl!" Mercifully, this picture doesn't show me below the waist which would have revealed a pair of torn up, nut-hugging jeans I found for the occasion. Last year, my brother and his wife, and my girlfriend and I attended a Halloween party together and we decided to go as a team of superheroes. We found these cheap (but very comfortable) "t-shirt and cape" costumes at BuyCostumes.com, so he and my sister-in-law went as Superman and Wonder Woman, while my girlfriend and I dressed as Batgirl and Batman, respectively. The Batman mask wasn't very comfortable actually. Anyway, no real plans for this year as we haven't been invited to any Halloween parties, yet. I may break out the Batman t-shirt again if I'm in a pinch, but aside from taking my daughter around the neighborhood I don't have any other plans. Monster Cafe does whatever a spider can! Find some unique costuming ideas at Whatever I Think Of! The Man Who Stares at Toys got to be something I always wanted to dress up as, but never did. So many WONDERful choices for Q the Adult! Dead Man Dan's a real Joker! A "shameful" showing at Cool and Collected! The Honeypot: Marvel, G.I. Joe & TF!